Domestic stock market closed on a higher note as Union Minister Piyush Goyal announced higher rural spending as well as tax exemptions in his Budget speech. 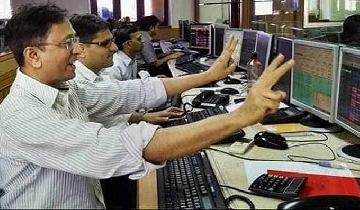 After surging over 500 points to hit the day"s high of 36,778.14, the S&P BSE Sensex ended 212.74 points, or 0.59 percent, higher at 36,469.43. Similarly, the NSE"s benchmark index Nifty finished 62.70 points, or 0.58 percent, higher at 10,893.65 after touching the day"s high of 10,983.45 from the previous close. The gains on Dalal street were led by buying in auto, IT, FMCG and pharma stocks. Heavyweights Reliance Industries, HDFC, Maruti, Infosys and Hero MotoCorp contributed most to the advances on the Sensex. Thirty four out of 50 Nifty stocks finished in the green. Overall, the market mood was positive throughout the day even as the government overshot the fiscal deficit target for the current financial year. Piyush Goyal said the fiscal deficit for the current financial year is expected to be 3.4 percent of Gross Domestic Product (GDP). As per the Budget estimate, the fiscal deficit for 2018-19 was pegged at 3.3 percent. In the Budget speech, Piyush Goyal also proposed to double the threshold tax exemption limit to Rs. 5 lakh and increased the standard deduction to Rs. 50,000 from Rs. 40,000. The proposal will benefit 3 crore middle-class tax payers, Goyal said while unveiling the budget proposals for 2019-20. This was the last Interim Budget of the NDA government led by Prime Minister Narendra Modi before the Lok Sabha elections due by May.